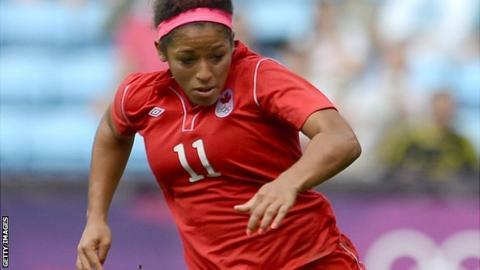 New Notts County Ladies signing Desiree Scott says she is relishing the chance of playing overseas for the first time. The 26-year-old signed in January but only joined up with the squad on Sunday because of a delayed visa. And the Canada international midfielder was soon in action, playing 90 minutes in the 1-1 draw with Arsenal and says the new experience was worth the wait. "It's a brand new team and a brand new country for me, so I'm excited to be here," Scott told BBC Radio Nottingham. "I think I left my legs on the plane but it was good to get out on the pitch, it's a whole new experience for me and something I needed to do. "I've never played overseas before but I'm looking forward to the journey." Scott has made 67 international appearances and earned the nickname 'the Destroyer' from a coach because of her combative nature and robust challenges. And she admits she knew very little about the women's game in England before joining the newly-formed Notts. "I just dived in and I'm ready to experience it all as I go through this season," she said. "I knew a couple of players from the England national team and I asked them about it, and they all said good things, so I thought I'd give it a try. "I love my nickname. I'm one of those players who likes to get into big tackles and that is what settles me into the game. My coach said one day 'She's destroying them' and it just stuck. "But I like it and I hope it shows in my play."